Her eyelids crusted with dried tears slowly open. She stretches and squints in the bright morning light and as she takes her first deep breath of the day the reality of yesterday settles into her heart and mind like a boulder sitting on her chest. Her beloved son is gone! 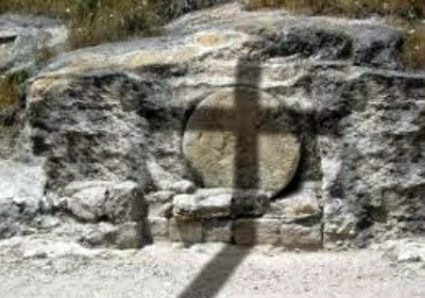 He is laying cold and alone in a tomb. She can't comfort him or see him anymore. She will never hear his voice again or have him near. His beautiful spirit will never occupy the same space as hers. The hole in her heart aches with longing. She can barely breathe as she gasps for air and the realization of him being gone flies like arrows towards her heart. With every arrow, the reality of his death becomes more confirmed in her spirit and yet there is a piece of it that struggles to protect itself from the truth. As she walks through that silent Saturday, she comes up against harsh reality time and time again. Every time the door opens, her heart leaps in the hope that it's him, but it's not. She looks for him in the crowds at the market, hoping that it is all just a dream. She was there. She saw the beatings and the nails, but in her mother's heart there still lies a tiny sliver of hope that somehow it was an awful nightmare. Instead of finding her beautiful son, she sees the sideways glances of people trying not to make eye contact. She sees people going out of their way to avoid her, because they don't know what to say. She hears the whispers of pity that surround her and it nearly crushes her. Don't they know how hard this is? Don't they realize what they have done? She shuffles back home and barely makes it. She collapses into her grief and wraps herself with her memories. Then, the questions come. Should I have kept him more sheltered? Could I have crushed that strong willed spirit out of him? Could I have convinced him to not preach? Should I have stopped him? Did I fail him as his mother? The weight of it all settles into her bones and just about crushes her completely and she cries out in a guttural response to the dark and lonely reality of grief and death. It is more than she can bear. He is gone! Sealed in a tomb. The world is harder and darker than it was yesterday. The darkness settles into her spirit and the hard edges of grief begin to cling to her heart. She can feel herself changing. Getting harder and bitter but she has no more fight left, nothing more to give. If the darkness takes her light, she won't fight it. She accepts her future with resignation and begins to numbly move through the rest of her day. No feelings, no heart, just motions. She finally makes it to her bed and collapses thankful that she made it through the day. Is this what the rest of her life will exist of? Will she walk through the rest of her life with a hardened heart just existing because the pain is all too much for her? She doesn't even have the mental capacity to sort it all out. She throws her herself under her covers and sleeps in the darkness and the cold. The last thought on her mind...is this what he feels like now? Cold, alone, lifeless....she gives up and drifts off into exhausted sleep. Maybe you are in the middle of your own silent Saturday. Perhaps hope seems lost and you are just trying to make it through your day without completely losing it. Friend, let me assure you I have been there and there has not been one time He has ever failed me. Put your hope in Him. Sit, listen, pray, learn, lean in, and abide in Him. It may be a silent Saturday but His mercies are new EVERY morning! And Resurrection Sunday is coming! He lives! And He redeems! And He restores! Trust Him with all your guts! Maybe you know He can, but you don’t trust that He will! Ask Him! And then LISTEN! He answers prayers especially if those prayers are seeking a new perspective. Ask Him to show you how He sees the situation and He will! I pray this Holy Week is full of His presence for both you and your children! We love you! I have, like much of the rest of America been watching the ever-popular show “This is Us.” Each week, the world has waited with eager anticipation to see this ordinary American family make something beautiful out of this thing called life. We’ve watched as little mistakes became teachable moments, mostly between parent and child. We’ve seen siblings love each other and hate each other, (which we can all relate am i right?). We’ve seen a marriage filled with so much genuine love, that also went through moments where love had to be a hard, fought-for choice, because emotions screamed otherwise. Watching this show has been a breathe of fresh air in so many ways as the writers and creators of this story were able to captivate millions. And they did this through reality. The reality that life is this tragically beautiful thing. It’s a combination of the sweetest, magical moments we jot down as “those memories to share with our grandkids” and the ruthless curveballs that leave us struck out, defeated, and question why we are even in the batter’s box. Very early on in the show, we find out that this family lost their dad, but we don’t know when or how. In the latest two episodes (of season 2 for reference), we finally see the climax appear and the aftermath revealed. Lie through my teeth is what I want to do right here. I want to grin and tell you that watching these last two episodes wasn’t like watching a rerun of my own life 13 years ago. Itching to not confess that after watching the literal heart wrench of the father’s death, that I felt like I just watched a mirror of my past through a television show. With some obvious detail changes, the premise remains parallel as tears streamed down my face in remembrance. Remembering when my mom came into the living room of our home with eyes drained of tears and a face tired of anguish as she faced her three unassuming children. Reliving the nightmare of hearing the words “your father has died” and fighting to face the reality that, that phrase was somehow true. Running scenarios through my head of how this could have been different and maybe this was my fault somehow. Ruined by the pain-staking thought of a life I was forced to live now, without my dad. Rigorously trying to be the strong one, seeing it as my responsibility as the oldest child and the daddy’s girl. Wrecked. It was rough. Oh so rough. As much as the sorrow shared between me and the screen brought back the shattering memory of loss like it was yesterday, it also brought an unimaginable hope. While recounting and recognizing the years of hurt, healing, sorrow, and joy that trickled on in the aftermath of this life altering event, I also rejoiced. Rejoicing that our story was somehow not over and we all are getting better, too. Much like the Pearson family, we were (and still are) so bruised. Today, this is us. This is my family. This is our story. We aren’t alone. We are not over. We are united together. The world in its inevitable brokenness didn’t break us even with its cruelest intentions. Because even though the sorrow surely lasted through the night, days, and at times felt like even years, we found joy. Joy came. Seeing the mom in the story (Rebecca) be coached on her strength by a long time friend, tears began to swell as I saw my own mom. The longer life goes on, the more I see in my mother the clear God-given capacity to love and move forward for our family. She did everything she possibly could to give us the life that wouldn’t be marked by tragedy, but renewed with hope. I know in the show they don’t hold to any particular faith belief, but this is where our healing looks different. It’s by grace alone we have made it to here. And here isn’t this place of arrival per say. Here is just where we are right now. Which is okay. We are okay. We are living this life with everything we’ve got. For me, my sister, my brother, and my mom, that all looks extremely different. My mom still being the most selfless woman I know. My sister being the brains and multi-talented one of the family. My brother having so much drive and integrity in the hard work he does for a living. 13 years later and we are living wildly different lives, but my goodness we are doing it. We are living. And we are trying. And in Jesus Christ, we have joy. We found joy. We found hope and the greatest strength and love, to carry on. So I have no idea where you are at in your own story. I presume somewhere along the way, as we all are. As you lean into today, and tomorrow, and the next day, hold fast to the fact that life is measured far less by a few big moments of brilliance and measured most by many little moments of faithfulness. This thing called life is a messy one and it will work to pull anything and everything out and away from us. My greatest joy was when I discovered that this world could have it all, but just give me Jesus and I’d be okay. Not okay as in “I’ll never suffer and things will always be peachy keen.” If that was true, then everything I wrote before that sentence about my own story was a lie. Being okay meaning that He is constant regardless of the inconsistencies and ever-changing circumstances. And with clinging to Him, I could have life and life abundant, no matter what else occurred to try and take that away. So ya this is us. For real. This is my life and my family kinda laid out bare for you. We are a work in progress. We are getting some things right and a lot of things wrong. We have some really great days and other days that we wish we could erase. But we are giving this life everything we’ve got and I’m sure as heck proud of that, and I know my dad would be, too. I share this all with you today not for a sympathy but for a symphony. A symphony of music and lyrics intertwined performing hope. And joy. They both came for me and my family. And Its coming for you to. So hold on. Be brave. Lean in. You don’t have to know the whole journey. P.S. Much like Jack Pearson, my dad was pretty stinking spectacular. We love and miss you so much daddy. If you want to follow Meghan's blog to see more of her writing just click on the link below. We are so thankful that she shared this with the Overflow Community. As I sat that first night and pondered over this image, I let my imagination take over. I imagined a beautiful lush, green hillside full of wildflowers and vegetation. I imagined a small wooden door opening as I came face to face with Jesus. As I looked past Him, I saw a mess. Tables overturned, chairs on their sides, people that had hurt me that I never wanted to see again, and people I hurt that I was embarrassed to see again. Behind him were all of my hurts and burdens that I had carried for so many years, all of the crutches and habits I had used to mask or numb the hurts, and all of the masks I wore to tell the world that I was just fine. Some of the mess had been cleaned up, but some that I thought were cleaned didn’t look so spectacular after looking a second or third time. They looked dingy and faded. Some of it still had pain attached and wasn’t cleaned up at all, but instead it looked glossed over. It reminded me of the cleaning job of a teenager. At first glance things looks clean, but they were still smudged and dirty underneath the surface. Perhaps to an untrained eye it appeared clean, but with closer inspection the fingerprints and caked on dirt was still there. I could have stayed focused on all of that, but Jesus caught my attention and lifted my gaze to His eyes and then to over His shoulder. He whispered, “Look past the mess!” As my eyes lifted over the mess and the past, I looked toward the far end of the room that seemed miles away and I saw a picture window full of light. I wondered in my heart what that window opened up to show. I yearned to get to that window. I wanted nothing else in that moment than to be standing at that window looking out on whatever was beyond it. But I knew there was work to be done, heart and soul work, which is sometimes the hardest kind! Throughout the week I walked past hurts and wounds that I thought were healed and whole, but I came to realize weren’t quite completely scarred over. They were still easily opened up with a word, a look, or a circumstance that brought me back to the pain, and sometimes a false identity lie of myself. Each time, Jesus would stop me and we would work out what the Truth of my identity was and each time the wound would get healed a little bit more. As I looked out the window, my eyes fell on the most gorgeous landscape full of life! I watched beautiful rivers glistening in the sunlight and I noticed trees full of fruit. I listened as wildlife frolicked and sang without a care in the world. As I looked out onto the land full of goodness, I felt free and full. I felt pure joy! I felt contentment! I was myself in my truest form. I was who I was created to be. I finally BELIEVED in my heart and in the marrow of my bones that I was a beloved daughter that was created in her Father’s image. All of the past hurts and burdens were gone. I had been brought back to my original design before all of life had happened and it was in that space that I found my true self. To get there, it required trust and transparency, requiring no performance, only presence. I had to be willing to let go of everything, but hold onto only one thing, Jesus. It required handing Him my heart and asking Him to examine it in its entirety and trusting Him to give it back to me whole and healthy. I had to lay down the various masks I wore, even with myself, and let Him see me bare and vulnerable without any defenses or excuses. It required being still and listening, really listening. It was hard and scary, but it was so worth it. The more I did it, the easier it became. As the week went on, I gained momentum and every day I learned a little bit more about me and my Savior. So let me ask you…How far in are you willing to go? Will you follow where He leads you, even if it hurts for a little while? Are you willing to trust that on the other side of that mess is freedom? Would you be willing to examine parts of your life that you thought were healed and whole and let Him tell you whether they really are or not? Can you let Him take you back there time and time again until HE is satisfied with the healing? He desperately wants to set you free, will you let Him? How far in are you willing to go? I have been graciously pointed to a few resources over the years. If you are just beginning your journey of healing let me offer these suggestions to you. Some are books and some are bible studies, but the most recent thing that I have found to be effective is mediation centered on God’s word. Check out the list below and know that I am praying for full and complete healing of each heart reading this blog. Happy Snow and Ice day in Houston! We thought what better way to help you warm up than to GIVE AWAY a free week of camp!!! Pine Cove in the City is coming back to Bayou City Fellowship Cypress this summer. Registration opens on Febuary 5th. We are including all the details below. If you have a son or daughter who wants to go to camp in the city this summer simply LIKE and TAG someone in the posts on social media. We will pick a winner this Thursday! Watch social media for the announcement. We’re loading up an incredible, jam-packed week of camp and bringing it to Bayou City Fellowship - Cypress Campus! We’ll be dancing, cheering, and jumping each and every day, Monday through Friday, in the most incredible week of your child’s summer. From amazing counselors and hilarious skits to thrilling activities and awesome Bible studies, 1st-6th grade campers are sure to have a blast! What: Campers will experience Jesus through Bible study, worship, and time with their counselor as well as participate in tons of great camp activities! Your 1st-6th grade camper is sure to have a blast dancing, cheering, and jumping each and every day, Monday through Friday! Stay warm friends! And remember to watch social media for the announcement of the winner! We hope and pray that your holidays were full of family, fun, love and laughter! We have missed you so much, and wanted to let you know about a few exciting events we have in store for YOU in 2018! We are absolutely giddy about how the Lord has gone before us and already planned out our year. We couldn’t wait to share all the details today, so that you can plan accordingly! Are you ready??? GET OUT THOSE CALENDARS…we can’t wait to see you! Our first event of the year will be Friday Night Overflow (FNO). It will be held on April 6th at 12715 Telge, home of Bayou City Fellowship - Cypress. FNO is a casual gathering where we can catch up with each other, meet new friends and enjoy a meal together. We always have a great speaker or a panel AND some fun and games! You never know what will happen because we love to keep it fun, encouraging and interactive! There will be childcare, but it will be limited, so watch social media as we get close to April to sign up. Don’t miss it! OK…are you ready for this??? We are SOOOOO excited to announce something new for Overflow. Our friend, Jennifer Maggio, from The Life of a Single Mom Ministry in Baton Rouge, Louisiana is bringing her national conference for single moms to Houston on June 8-9 at Houston First Baptist Church. This is going to be an incredible event where women from all over the nation will gather together under one roof to praise God and learn from gifted speakers, authors and experts in their fields – ALL focused on encouraging and equipping single moms! Our plan is to gather our Overflow community together and sit as a group at the conference. We can carpool and maybe even share a meal together! We will develop more plans when we get the schedule and more details for the weekend. Don’t worry about the kids and teens because they have great plans in place to care for kids at the conference with programs designed just for them! I have personally been to one of Jennifer Maggio’s conferences in Louisiana and they do not disappoint. You will find tons of information and encouragement on your journey as a woman parenting on your own. Make sure you mark these dates down and go ahead and register for the conference here: http://thelifeofasinglemom.com/2018-national-tlsm-single-moms-conference/. Finally, we are beyond excited to announce that our very own annual Overflow conference will be happening on Saturday, October 13th. You are going to flip over our featured speaker – ANGELA THOMAS! She’s a great communicator, fun and energetic speaker and author of many books including My Single Mom Life! On top of this, we can’t wait to host all of you at our Bayou City Fellowship – Spring Branch NEW worship center that is being renovated this year from a big empty warehouse! We will have many more details coming as the time gets closer, but expect something fresh, recharged and inspiring to meet you right where you are with amazing worship music, door prizes, surprises and most of all a day to draw close to your God who loves you passionately! 2018 is looking so full of the goodness of the Lord. We are so grateful for you in our lives and hope that you will join us at these events! But no need to wait until April, you are welcome every Sunday to join us at both Bayou City Fellowship campuses and at the many women’s events going all year! Always, know that you can contact us at overflow@bayoucityfellowship.com with your questions and prayer requests! You are loved. Maybe you’re like me and you have this song memorized or perhaps you have heard it a few time since you began swapping out your Thanksgiving decorations for all things merry and bright. I really like to think about what I’m singing, and I particularly love these lyrics this year. Do you ever think about what you are hoping for? Where is our hope found? Is it rooted and established in a divine love that has shaped and continues to change our lives? This is not the same kind of hope we have for our kids future or hope for a future husband. There is a thrill of hope in Christ that is so much deeper. In the Lord’s prayer, Jesus invites us into God’s Kingdom on earth as it is in heaven. The profoundness of this prayer, to ask the Father to bring heaven to life in our hearts, minds, and lives, is what Christmas is celebrating. The hope of heaven on earth is thrilling! If you know me, you know I’m much more of a realist than an optimist. I’m analytical to a fault. Sometimes, I feel like I need to understand things before I can put all my eggs in a basket with full confidence in the return of investment. I’ve been burned by those I’ve put all my trust in. I’ve been betrayed by friends who professed their loyalty. I’ve known unspeakable psychological confusion that only an all-knowing God could minister to through the power of His Word. I’ve known longing that’s made me physically ache and needed answers that had no human could speak into. I’ve struggled to pay the bills as a single mom with no end in sight. I’ve felt the cinderblocks of anxiety on my chest before I even opened my eyes for a new day. That hope we just talked about plays in here, because so many of these moments collided with my heavenly Father coming to comfort me and my Jesus coming to counsel me through the Holy Spirit. My optimism is real and overcomes my human tendency to overanalyze with incomplete data- because Jesus is real. Don’t miss this. Submit yourself to this truth. Have you been wrestling with anxiety as Christmas approaches? Is this season just generally hard for you, because it reminds you of loss, disappointment, or poverty (monetarily or in spirit)? Fall on your knees, and let the invitation of Jesus be on your lips. Let’s not try to brave this season of Christmas by holding tightly to the lie of loneliness. God loves you and desires to be in relationship with you, covering those areas of aloneness with His gentle, loving, forgiving, all-knowing presence. Jesus took off his robe of light (wrap your mind around that statement), and put on flesh to come be with us. He came not just to teach us the way to navigate this troubled broken world, but also to give us the greatest gift of all - the best of Himself in every way. He came to establish His kingdom and presence in our very hearts. He came incarnate to live with us and to die for us. Then, He sends us the Holy Spirit who will help, comfort, teach, and lead us through this life in the deepest, most fulfilling way with Him and with each other. Do you feel utterly wiped out? Maybe it feels like a flag of defeat has been flying over you and your home this year, because you haven’t made the best choices and now you’re stuck trying to right wrongs with your own strength. Or maybe you have experienced tremendous loss that has left a chasm in your life that you’re not really sure what living is supposed to look and feel like. The common and understandable “error” here is forgetting hope. Defeat in our lives begins when the lies the enemy has spoken to us begin to take root and dictate our responses. There’s no condemnation in that, and if you could see my face, you’d also feel my hands holding yours with the most sincere eyes, as I tell you that victory over the tangible darkness starts and ends with Jesus. ‘Til He appeared, and the soul felt its worth. I am fully convinced that the choices we make, the way we see ourselves, stems directly from the way we understand God’s love for us and others. Do you know that if you are in Christ, Jesus is preparing a place for you to be with Him for eternity? He is wild about you. He is with you. Nothing can separate God’s heart being geared toward your good and His glory shining wildly through your life. When we believe the lie “you are alone”, we begin to toil in frantic desperation or depression rather than remembering the truth of God with us. There is joy in knowing that we are never truly alone and that the one who is in complete control completely has us. Alone is a lie. When we believe that “no one understands me”, we begin to seek to be understood and fulfilled in ways that often perpetuate a sense loss through shallow connections. We forget that God created us, loves us, offers forgiveness and loves to keep His promise of full restoration. In Him, we are known, truly known, and loved completely, through and through. You are worthy of love, because He says so and proved it. He hasn’t changed His mind about you. Sister, when Jesus was asked what the most important command was, he told them to love the Lord our God with all our soul, our mind, our strength, and to love our neighbor as ourselves. We are hardwired for relationship with our Creator and with each other. This celebratory season of Christmas summons us to build into relationships with God and with others. Christ is the Lord? O praise His Name forever. My prayer for us this season is that we would truly know the hope and salvation that we find in our Heavenly Father through the finished work of Christ through the power of the Holy Spirit.